We love scented candles and are quite sure you feel the same way. Those beautiful little lumps of wax are the ideal way of creating a wonderful ambience in your home, and you can use them in pretty much any room ”“ wherever takes your fancy! You can use scented candles to add a little something extra to your home without having to raid the bank account… or you can simply light one and drift away with a heavenly aroma drifting around your nose. You can set a mood so easily using one; in fact, they’ll create different effects depending on where you choose to place them and which particular fragrance you’ve picked. Here’s a bit of guidance, just in case. This is the place to put your gorgeous scented candles. The bedroom can benefit in a number of different ways ”“ for example, if all you want to do is chill out, relaxing in the evening before bedtime proper, a lovely English rose scent can send you off into a serene, Jane Austen-like scene. Maybe you’re after a romantic ambience. Sandalwood, jasmine and ginger are all said to be aphrodisiacal scents, so light one up and let the mood take you! The flickering of the candles can really help set the scene, too. A word to the wise though ”“ if you’re pregnant, try and avoid jasmine… stick to sandalwood or ginger. When it comes to the bathroom, there is ”“ of course ”“ one obvious, but rather unsavory, use. The nice scents of a candle can quickly overpower any “less than nice” scents, making them perfect for the lav. As usual though, this isn’t the only use! Oh no; how about lighting up a lovely lavender candle? Lavender is well-known for its soothing aroma, you can climb into a beautifully bubbly bath and let the aroma whisk away all your aches and pains, stresses and worries. For other great scents to use in the bathroom, take a gander at the Portmeirion Online website; they have many to choose from! Okay, so you might be thinking that candles in the kitchen are a bad idea ”“ after all, you’ve got all those lovely food smells emanating from the pots and pans on the stove already, right? However, sometimes the food smell can be overpowering: lots of garlic or cabbage, for example, can create some right royal whiffs. Use a nicely-scented candle to counteract those pongs! If not, you could always choose scents like fresh-baked bread to create a really homely, welcoming atmosphere ”“ it makes the perfect aroma to come home to! 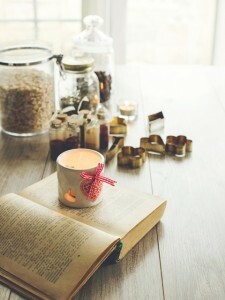 Hopefully these hints will inspire you to incorporate more scented candles into your home. There are plenty of other ways in which you can use them to change the mood of a room; try different scents and experiment with them to find your favorite results! Tom Bowers is a blogger and a writer from the UK who writes from a number of publications on everything from interior design to festival and gig reviews.